Panoramic and periapical radiographs are frequently used in routine dental examination. Panoramic radiography is employed as the primary imaging technique for the evaluation of impacted teeth and involved lesions. The information obtained from this radiography is helpful for diagnosis, follow-up of tooth eruption, and treatment results; but it may not be enough in most cases. Cone beam computed tomography (CBCT) provides precise and accurate information better than conventional radiographs in terms of relation of the impacted tooth with the adjacent tooth, nasal floor, maxillary sinus, and mandibular canal in three dimensions. We aimed to that retrospectively scanned to detect impacted teeth, to determine the pathologies and frequencies of these impacted teeth, and to evaluate the relationship of impacted teeth to adjacent anatomical structures, in the CBCT archive of Ataturk University, Faculty of Dentistry. 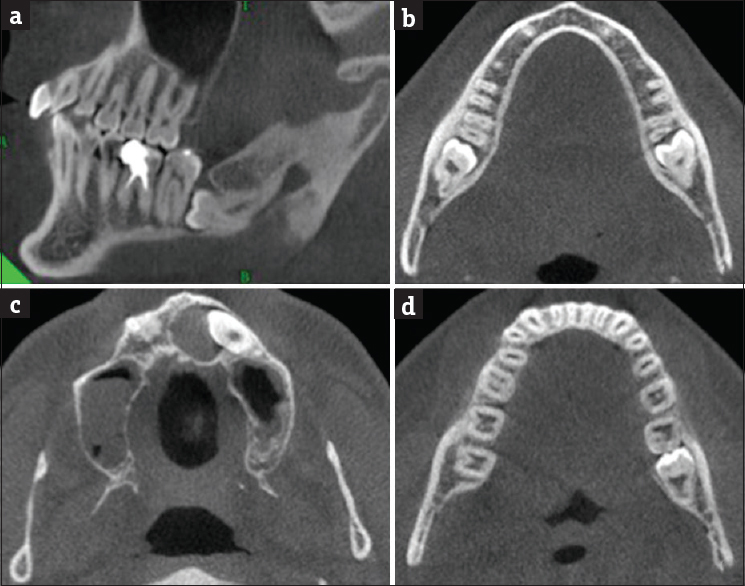 In the present study, 608 CBCT images of patients who underwent CBCT imaging for various diagnostic purposes such as impacted tooth, pathologic lesion, orthodontic treatment, and implant treatment planning were evaluated retrospectively. In the study, the CBCT examinations that were performed at Ataturk University Faculty of Dentistry, Department of Dentomaxillofacial Radiology were used. The study was conducted in accordance with the Helsinki Declaration of 1975, as revised in 2008, and the protocol was approved by our faculty ethics committee of three (project identification code). The CBCT scans which include the whole maxillary and mandibular dentoalveolar structures included in the study. CBCT imaging was performed using a NewTom 3G (Quantitative Radiology, Verona, Italy) which has a maximum output of 110 kV and 15 mA, a 0.16-mm voxel size, and an approximate 5.4-s exposure time as scanner parameters. CBCT images were examined on 0.5 mm axial images first; then, coronal, sagittal, and cross-sectional images were examined on multiplanar reconstructions. Primarily, the impacted tooth entity was evaluated; then, the relations of the impacted tooth and anatomical structures and pathologies that caused by impacted tooth such as cysts or tumors, tooth decay, root resorptions, and bone resorptions were evaluated. The CBCT examinations were established by three observers with at least 3 years of experience with CBCT. Any conflicts in the reviews were resolved by consensus with the participation of master who has 10 years of experience with CBCT. Data were transferred to the SPSS software program (SPSS v. 20.0 for Windows, SPSS Inc., Chicago, IL). The descriptive analyses and frequencies were calculated. In the study of 608 patients, CBCT images were examined and the mean age was 31.64 ± 16,614. In 34.37% of these 608 patients, 209 patients had impacted teeth. Of the 209 patients with impacted teeth, 115 were female and 94 were male. A total of 394 impacted teeth were detected in these patients. In maxilla, 17 (4.3%) central incisors, 6 (1.5%) lateral incisors, 97 (24.6%) canines, 4 (1%) first premolars, 10 (2.6%) second premolars, 1 (0.3%) second molar, and 66 (16%) third molars were observed as impacted. There were no impacted first molar teeth in maxilla [Table 1]. On the other hand, 5 (1.3%) central incisors, 9 (2.3) lateral incisors, 19 (4.8%) canines, 7 (1.8%) first premolars, 16 (4%) second premolars, 2 (0.6) first molars, 8 (2%) second molars, and 94 (23.9%) third molars were observed as impacted in mandible [Table 2]. In addition, a total of 36 supernumerary impacted teeth, of which 26 were mesiodens, were observed in 394 impacted teeth. In this case, impacted teeth most frequently were the maxillary canine teeth (24.6%), mandibular third molar teeth (23.9%), maxillary third molar teeth (16%), mandibular canine teeth (4.8%), maxillary central incisor teeth (4.3%), mandibular second premolar teeth (4%), maxillary second premolar teeth (2.6%), mandibular lateral incisor teeth (2.3%), mandibular second molar teeth (2%), mandibular first premolar teeth (1.8%), maxillary lateral incisor teeth (1.5%), mandibular central incisor teeth (1.3%), maxillary first premolar teeth (1%), mandibular first molar teeth (0.6%), maxillary second molar teeth (0.3%), and maxillary first molar teeth (0%), respectively. About 175 teeth (44.4%) of total 394 impacted teeth caused the periodontal bone loss; 130 teeth (33.3%) of all teeth caused resorption in the adjacent teeth, 34 teeth (8.6%) of all teeth caused cysts or tumors, and 9 teeth (2.3%) of all teeth caused decay lesions in the adjacent teeth [Figure 1] and [Table 3]. Impacted teeth were examined according to the presence of pathology with Federation Dentaire Internationale Numbering System. But nonpathological teeth were not included to the chart [Figure 2]. In our study, the teeth that caused the most periodontal bone loss were found as right mandibular third molar teeth and the teeth that cause the most resorption in the adjacent teeth are the left maxillary canine teeth. Moreover, the teeth mostly caused cysts or tumors that are bilateral maxillary canines and mandibular third molars, and the left mandibular third molar teeth were observed as the teeth that caused the most decay in adjacent tooth. The proximity of the impacted teeth to the anatomical regions is also important. In the present study, 293 teeth (74.4%) of the 394 impacted teeth were found as adjacent to or near the anatomical regions like mandibular canal, mental foramen, incisive canal, maxillary sinus, and nasal fossa. The most common causes of this condition are left maxillary third molars, right maxillary canines, right maxillary third molars, right mandibular third molars, left maxillary canines, left mandibular third molars, and mesiodenses. The incidence of impacted teeth varies in various ethnic populations and different countries from 5.6% to 38%., This differences in incidence may be due to differences in the genetic and ethnic backgrounds of the patients., About 34.37% (209 patients) of the 608 patients included in our study had impacted teeth. Impacted teeth are more common in the maxilla compared to mandible. In addition, impacted canine teeth represented the most of all impacted maxillary teeth. Results of our study showed that the impacted teeth were seen more at the maxilla and identified that canine teeth were the impacted teeth of the highest rate in the maxilla. The most frequently impacted teeth are the third molar teeth followed by maxillary canine teeth; this is also followed by mandibular canine teeth, and premolar teeth rank fourth commonest.,,,, Third molar teeth are the mostly impacted teeth (16.7–68.6% of all impacted teeth)., Impacted maxillary canine teeth of the incidence range from 0.2% to 3.58%, whereas the incidence of impacted mandibular canine is very low as 0.35%.,,, But the mandibular canine impaction is more frequent compared to incisors and premolars. In addition to these, we can say that the left mandibular third molar teeth and the left maxillary canine teeth are seen as the most common impacted teeth in our study. Moreover, our study supports the literature that impacted maxillary canine teeth were followed by impacted mandibular canine teeth. In some studies, the incidence of impacted premolar teeth is estimated to be ranging from 2.1% to 2.7%. In addition, mandibular premolar teeth are reported to have a higher rate of prevalence than maxillary premolar teeth. In addition to these data, similar results were found in our study. In some studies, the prevalence of impacted maxillary incisor teeth is 0.42% to 2.1%. Impacted molar teeth (except the third molar teeth) is a very rare abnormality, both in the literature and in our study. Supernumerary teeth are not an unusual condition and the mesiodens is the most common supernumerary tooth as 80% of all supernumerary teeth. In the literature, the prevalence of supernumerary teeth varies between 0.3% and 3.8% and mesiodens varies between 8% and 34%. A study in Turkish population discloses that the most common supernumerary tooth was mesiodens, followed by premolar, lateral, distomolar, paramolar, and canine teeth. 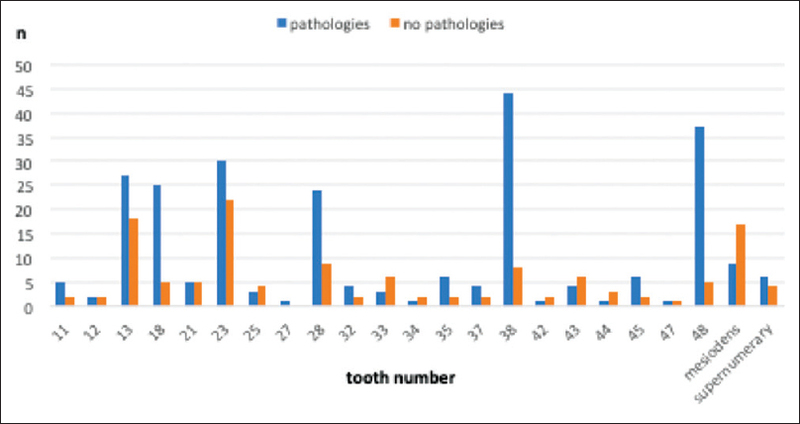 In our study, 36 of the 394 impacted teeth were the impacted supernumerary teeth and 26 of these teeth were mesiodens. The mesiodens were also the most common supernumerary teeth in the present study in accordance with the literature. The presence of impacted and supernumerary teeth can cause various problems. These are periodontal bone loss at the root surface of the adjacent teeth, resorption and decay lesions in the adjacent teeth, and cysts or tumors., In our study, 44.4% (175 teeth) of total 394 impacted teeth caused the periodontal bone loss; 33.3% (130 teeth) of all teeth caused resorption in the adjacent teeth; 8.6% (34 teeth) of all teeth caused cysts or tumors; 2.3% (9 teeth) of all teeth caused decay lesions in the adjacent teeth. Studies have reported that the third molar teeth are one of the causes of periodontal problems, and after the third molar tooth extraction periodontal healing, a healthy state has been observed in the mouth.,,,,,, Offenbacher et al. show that semi-impacted teeth are serious periodontal risk factors. Montero and Mazzaglia expressed periodontal healing after the third molar tooth extraction. Matzen et al. reported that marginal bone loss in their study of third molar teeth is 49%. In the present study, periodontal bone loss was the most common pathology caused by impacted teeth also and the right mandibular third molar was the most common cause. Matzen et al. reported that 71% of the third molar teeth in the mesioangular position and 64% of the third molar teeth in the cervical contact with the second molar tooth had a resorption field in the second molar teeth. McArdle and Renton stated that 82% of the third molar teeth with 40°–80° of inclination would cause resorption on the distal surfaces of the second molar teeth. In the studies, this resorption is more likely to be caused by impacted third molars in the mesioangular position.,,,, However, Oenning et al. reported that the third molar teeth in mesial and horizontal positions had the same resorption rate. In our study, the tooth that causes the most resorption in the adjacent teeth was the left maxillary canine. Impacted teeth were found as having a relationship with lesions such as dentigerous cysts, unicystic ameloblastomas, ameloblastomas, ameloblastic fibromas, calcifying odontogenic cysts, adenomatoid odontogenic tumors, calcifying epithelial odontogenic tumors, ameloblastic fibro-odontomas, keratocystic odontogenic tumors, central giant cell granuloma, odontomas, etc.,,, Dentigerous cyst, unicystic ameloblastoma, ameloblastoma, and ameloblastic fibroma are most frequent with the mandibular third molar teeth., While ameloblastomas occur in association with an impacted teeth in 15–40% of cases, between 50% and 80% of unicystic ameloblastoma cases are associated with impacted teeth. Calcifying odontogenic cysts are associated with impacted teeth in 10–32% of cases. According to the literature, at least 73% of adenomatoid odontogenic tumors occur in association with an impacted teeth, most commonly maxillary canines, lateral incisors, and mandibular premolars. Additionally, these tumors are seen mostly with the maxillary canine teeth in 60% of cases. Calcifying epithelial odontogenic tumors are associated with an impacted teeth and odontoma in 52–60%. The highest prevalence of these lesions is in the mandibular molar region, followed by the maxillary molar region and the mandibular premolar region. An association between impacted teeth and the ameloblastic fibromas has been seen in 75% of cases. In addition, studies have reported that the rate of tumor and cyst development from impacted teeth may range from 0.001% to 2.31%.,, Matzen et al. showed that in the study, 25% of the impacted third molar teeth had a larger dental follicle. Adaki et al. found 56% normal, 23.3% cystic transformation, 22% dentigerous cyst, and 1.2% odontogenic keratocyst with a dental follicle width of over 2.5 mm, and this has shown us that 44% of the impacted teeth with large follicles may have pathology. According to the compilation published by Adeyemo et al., the incidence of tumors is between 0.14% and 2%. In our study, the most common pathological teeth were bilateral maxillary canine teeth and bilateral mandibular third molar teeth. One of the common complication of the impacted third molar teeth is cavities and root resorption on the distal surfaces of the second molar teeth. A number of studies in the literature have shown that cavities on the distal surfaces of the second molar teeth due to contact and pressure are created by the positions of the third molar teeth.,,,,,,,, A study reported that total of 39% of the patients with impacted mandibular third molar teeth had distal cervical decay in adjacent teeth. In conducting a study among Turkish population, the prevalence of the distal decay of second molar teeth was 20%. In our study, the left mandibular third molar tooth was observed as the tooth that caused the most decay in adjacent tooth. Impacted teeth tend to be in proximity to mandibular canal, mental foramen, incisive canal, nasal cavity, and maxillary sinus. Therefore, these teeth are risky during the surgical operation or the infections of anatomical regions in which they are adjacent. In our study, 74.4% (293 teeth) of the 394 impacted teeth were found as adjacent to or near the anatomical regions such as mandibular canal, mental foramen, incisive canal, maxillary sinus, and nasal fossa. Panoramic, periapical, and occlusal radiographs are conventional radiography techniques used in clinical practices. Superimposition of the anatomical structures in two dimensional views sometimes can prevent the accurate diagnosis. In the examination of impacted teeth, addition to these radiograms and also CBCT is in the use. CBCT is superior to panoramic radiographs in terms of clarity and gives the radiologist a serious advantage.,,, As a result of evaluations done with CBCT, much more radiographic results have been found.,, Matzen et al. found that if the cases were examined with CBCT, more results would be found and 22–27% more molars would be removed. This finding reveals the advantage of CBCT in diagnostic procedures, but in the same study, it was also found that there was no difference between panoramic radiography and CBCT in diagnosis of dental follicle. Suomalainen et al. showed that the detection of the inferior mandibular nerve, teeth root morphology, and relation to this nerve with CBCT is much better than panoramic radiography. Eyrich et al. stated that nerve damage was lower in CBCT-operated surgeries. In addition, Caglayan et al. have shown that except for the purpose of prompting in diagnostic procedures performed with CBCT, incidental problems can be found as high as 92.8%. One of the most asked questions of the dentist is whether the impacted teeth should be extracted or followed over time. There is no general approach to assessing impacted teeth. The extraction or follow-up decision has been described by various authors in various formats. The general opinion in this regard is that if a pathology or symptom is found, the tooth should be removed.,, Also, the extraction of impacted teeth associated with significant anatomical points can be risky. So if there is no pathology or symptom, impacted teeth should be followed up.,, Friedman said that the proflactic extraction is a public health hazard and has to be avoided seriously. Hill emphasized that asymptomatic teeth should be followed for at least 2 years. Adeyemo said that the decision to extraction should not generalize and had to be assessed separately for each case. Impacted teeth are common and they often cause a pathology. There is no general approach to according to its own situation. If the impacted teeth do not cause pathology, they can be controlled. In suspected cases, it can be clearly assessed with CBCT. A part of this study has been shared as an oral presentation at International Congress on Preventive Dentistry in Erzurum, Turkey on March 5–8, 2018. All procedures were followed in accordance with the ethical standards of the responsible committee on human experimentation (institutional and national) and with the Helsinki Declaration of 1975, as revised in 2008. Informed consent was obtained from all patients for being included in the study. Al-Zoubi H, Alharbi AA, Ferguson DJ, Zafar MS. Frequency of impacted teeth and categorization of impacted canines: A retrospective radiographic study using orthopantomograms. Eur J Dent 2017;11:117-21. D'Oleo-Aracena MF, Arriola-Guillén LE, Rodríguez-Cárdenas YA, Ruíz-Mora GA. Skeletal and dentoalveolar bilateral dimensions in unilateral palatally impacted canine using cone beam computed tomography. Prog Orthod 2017;18:7. Manjunatha BS, Chikkaramaiah S, Panja P, Koratagere N. Impacted maxillary second premolars: A report of four cases. BMJ Case Rep 2014;2014. doi: 10.1136/bcr-2014-205206. Alhammadi MS, Asiri HA, Almashraqi AA. Incidence, severity and orthodontic treatment difficulty index of impacted canines in Saudi population. J Clin Exp Dent 2018;10:e327-4. Syed KB, Alshahrani FS, Alabsi WS, Alqahtani ZA, Hameed MS, Mustafa AB, et al. Prevalence of Distal Caries in Mandibular Second Molar Due to Impacted Third Molar. J Clin Diagn Res 2017;11:ZC28-30. Gecgelen M, Aksoy A. Etiology, diagnosis and treatment of impacted teeth. Smyrna Med J 2012;2:64-8. Mortazavi H, Baharvand M. Jaw lesions associated with impacted tooth: A radiographic diagnostic guide. Imaging Sci Dent 2016;46:147-57. Chandak S, Shetty CM. Comparative study of dentascan and radiography for radiological evaluation of impacted teeth. J Clin Diagn Res 2014;8:RC01-5. Matzen LH, Schropp L, Spin-Neto R, Wenzel A. Radiographic signs of pathology determining removal of an impacted mandibular third molar assessed in a panoramic image or CBCT. Dento Maxillo Fac Radiol 2017;46:20160330. El-Khateeb SM, Arnout EA, Hifnawy T. Radiographic assessment of impacted teeth and associated pathosis prevalence. Pattern of occurrence at different ages in Saudi male in Western Saudi Arabia. Saudi Med J 2015;36:973-9. Miclotte A, Grommen B, Cadenas de Llano-Perula M, Verdonck A, Jacobs R, Willems G. The effect of first and second premolar extractions on third molars: A retrospective longitudinal study. J Dent 2017;61:55-66. Kaczor-Urbanowicz K, Zadurska M, Czochrowska E. Impacted teeth: An interdisciplinary perspective. Adv Clin Exp Med 2016;25:575-85. Pico CL, do Vale FJ, Caramelo FJ, Corte-Real A, Pereira SM. Comparative analysis of impacted upper canines: Panoramic radiograph vs cone beam computed tomography. J Clin Exp Dent 2017;9:e1176-82. Jung YH, Kim JY, Cho BH. The effects of impacted premaxillary supernumerary teeth on permanent incisors. Imaging Sci Dent 2016;46:251-8. Gurler G, Delilbasi C, Delilbasi E. Investigation of impacted supernumerary teeth: A Cone Beam Computed Tomograph (CBCT) study. J Istanb Univ Fac Dent 2017;51:18-24. Oenning AC, Melo SL, Groppo FC, Haiter-Neto F. Mesial inclination of impacted third molars and its propensity to stimulate external root resorption in second molars--a cone-beam computed tomographic evaluation. J Oral Maxillofac Surg 2015;73:379-86. Campbell JH. Pathology associated with the third molar. Oral Maxillofac Surg Clin North Am 2013;25:1-10, v.
Offenbacher S, Beck JD, Moss KL, Barros S, Mendoza L, White RP, Jr. What are the local and systemic implications of third molar retention? J Oral Maxillofac Surg 2012;70 (9 Suppl 1):S58-65. Montero J, Mazzaglia G. Effect of removing an impacted mandibular third molar on the periodontal status of the mandibular second molar. J Oral Maxillofac Surg 2011;69:2691-7. 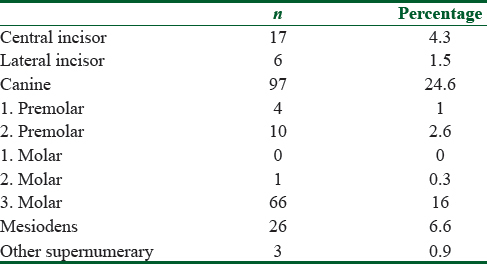 Polat HB, Ozan F, Kara I, Ozdemir H, Ay S. Prevalence of commonly found pathoses associated with mandibular impacted third molars based on panoramic radiographs in Turkish population. Oral Surg Oral Med Oral Pathol Oral Radiol Endod 2008;105:e41-7. Nance PE, White RP Jr, Offenbacher S, Phillips C, Blakey GH, Haug RH. Change in third molar angulation and position in young adults and follow-up periodontal pathology. J Oral Maxillofac Surg 2006;64:424-8. Matzen LH, Schropp L, Spin-Neto R, Wenzel A. Use of cone beam computed tomography to assess significant imaging findings related to mandibular third molar impaction. Oral Surg Oral Med Oral Pathol Oral Radiol 2017;124:506-16. McArdle LW, Renton TF. Distal cervical caries in the mandibular second molar: An indication for the prophylactic removal of the third molar? Br J Oral Maxillofac Surg 2006;44:42-5. Schneider T, Filo K, Kruse AL, Locher M, Gratz KW, Lubbers HT. Variations in the anatomical positioning of impacted mandibular wisdom teeth and their practical implications. Swiss Dent J 2014;124:520-38. Chang SW, Shin SY, Kum KY, Hong J. Correlation study between distal caries in the mandibular second molar and the eruption status of the mandibular third molar in the Korean population. Oral Surg Oral Med Oral Pathol Oral Radiol Endod 2009;108:838-43. Allen RT, Witherow H, Collyer J, Roper-Hall R, Nazir MA, Mathew G. The mesioangular third molar--to extract or not to extract? Analysis of 776 consecutive third molars. Br Dent J 2009;206:E23; discussion 586-7. Karam Genno N, Aoun N, El Toum S. Adenomatoid odontogenic tumor associated with an impacted maxillary lateral incisor: A case report with five-year follow-up. Case Rep Dent 2017;2017:1709492. Guven O, Keskin A, Akal UK. The incidence of cysts and tumors around impacted third molars. Int J Oral Maxillofac Surg 2000;29:131-5. Adeyemo WL. Do pathologies associated with impacted lower third molars justify prophylactic removal? A critical review of the literature. Oral Surg Oral Med Oral Pathol Oral Radiol Endod 2006;102:448-52. Stathopoulos P, Mezitis M, Kappatos C, Titsinides S, Stylogianni E. Cysts and tumors associated with impacted third molars: Is prophylactic removal justified? J Oral Maxillofac Surg 2011;69:405-8. Adaki SR, Yashodadevi BK, Sujatha S, Santana N, Rakesh N, Adaki R. Incidence of cystic changes in impacted lower third molar. Indian J Dent Res 2013;24:183-7. Yamaoka M, Furusawa K, Ikeda M, Hasegawa T. Root resorption of mandibular second molar teeth associated with the presence of the third molars. Aust Dent J 1999;44:112-6. Falci SG, de Castro CR, Santos RC, de Souza Lima LD, Ramos-Jorge ML, Botelho AM, et al. Association between the presence of a partially erupted mandibular third molar and the existence of caries in the distal of the second molars. Int J Oral Maxillofac Surg 2012;41:1270-4. McArdle LW, McDonald F, Jones J. Distal cervical caries in the mandibular second molar: An indication for the prophylactic removal of third molar teeth? Update. Br J Oral Maxillofac Surg 2014;52:185-9. Bouquet A, Coudert JL, Bourgeois D, Mazoyer JF, Bossard D. Contributions of reformatted computed tomography and panoramic radiography in the localization of third molars relative to the maxillary sinus. Oral Surg Oral Med Oral Pathol Oral Radiol Endod 2004;98:342-7. Suomalainen A, Ventä I, Mattila M, Turtola L, Vehmas T, Peltola JS. Reliability of CBCT and other radiographic methods in preoperative evaluation of lower third molars. Oral Surg Oral Med Oral Pathol Oral Radiol Endod 2010;109:276-84. Caglayan F, Tozoglu U. Incidental findings in the maxillofacial region detected by cone beam CT. Diagn Interv Radiol 2012;18:159-63. Eyrich G, Seifert B, Matthews F, Matthiessen U, Heusser CK, Kruse AL, et al. 3-Dimensional imaging for lower third molars: Is there an implication for surgical removal? J Oral Maxillofac Surg 2011;69:1867-72. Hill CM, Walker RV. Conservative, non-surgical management of patients presenting with impacted lower third molars: A 5-year study. Br J Oral Maxillofac Surg 2006;44:347-50. Friedman JW. The prophylactic extraction of third molars: A public health hazard. Am J Public Health 2007;97:1554-9. Almendros-Marques N, Alaejos-Algarra E, Quinteros-Borgarello M, Berini-Aytes L, Gay-Escoda C. Factors influencing the prophylactic removal of asymptomatic impacted lower third molars. Int J Oral Maxillofac Surg 2008;37:29-35.